The ERR_EMPTY_RESPONSE message is not a virus or malware infection that has corrupted the windows file or used browser! For example, the website at www.softwareok.com you may want to open may be temporarily unavailable or has been permanently moved to a new web address, so try to open the website later. See also: ►►► How to find the BIT on my PC? Please check the address for spelling, capitalization or other errors. Please check if the address has been renamed, deleted or moved. The page can not be displayed. • Make sure that the web address https://www.softwareok.de is correct. • Search the page with your search engine. • Refresh the page in a few minutes. Google Analytics doesn't track the referral, why? Is dropbox.com free and useful? Problem PERL on ISS 7.5 MS Web Server, invalid character: "? 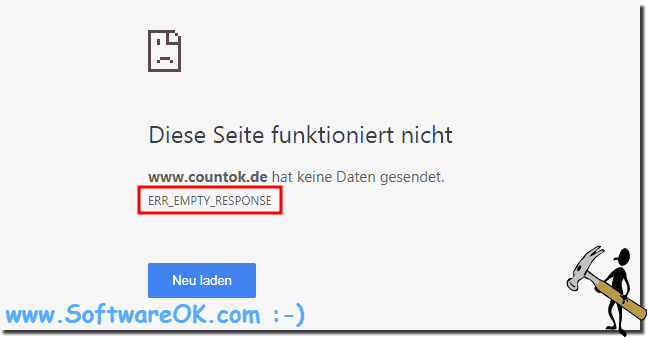 How to Fix ERR_EMPTY_RESPONSE Error in Google Chrome? How to Fix ERR_EMPTY_RESPONSE or No Data Received Error? Chrome is actually running properly, only when calling http://softwareok.com the browser freezes for minutes?